Spay and Neuter Awareness Month starts on February 1st. Because this is such an important topic, we do a show on it every year. Ten years ago, the decision of whether to spay and neuter and when to do so was much more straightforward. As new information has become available spaying and neutering has gotten a bit more confusing, especially the timing of spaying and neutering. Don has been known to say that if you ask five pet care professionals about spaying and neutering, you may get seven different opinions. Spaying and neutering have implications for animal welfare as well as physical and behavioral health, and it is a topic that every pet owner needs to discuss with their veterinarian. 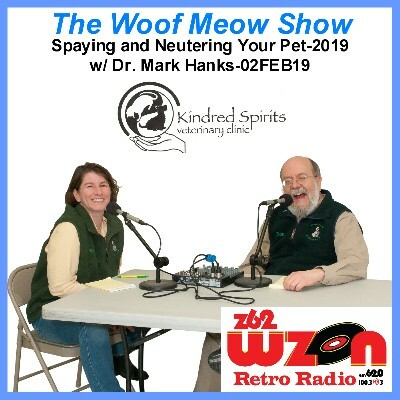 Today, Don will be talking to Dr. Mark Hanks from the Kindred Spirits Veterinary Clinic to help end some of the confusion of this critical topic. If you have a pet that is not spayed or neutered, you will not want to miss this show. You can hear The Woof Meow Show on Z62 Retro Radio, AM620, and WKIT HD3 at 9 AM on Saturday. If you are not near a radio, listen on your computer at http://bit.ly/AM620-WZON or your smartphone or tablet with the free WZON 620 AM app. A podcast of the show is typically posted immediately after the show. 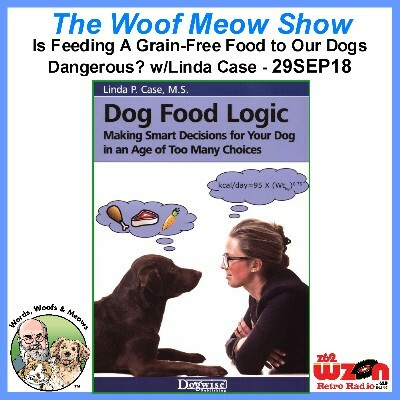 You can download this show and others at http://woofmeowshow.libsyn.com/, at Don’s blog http://bit.ly/Words-Woofs-Meows and the Apple iTunes store. 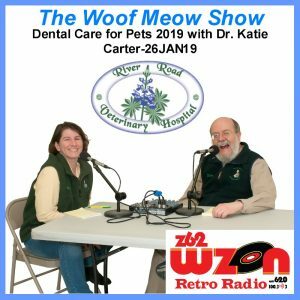 In this episode of The Woof Meow Show from January 26th, 2019 Don interviews Dr. Katie Carter from River Road Veterinary Hospital about pet dental care and the importance of preventing and treating periodontal disease in your pet. Chronic inflammation or an infection in your pet’s mouth, gingivitis, is every bit as serious as an infection anywhere else. When left untreated, periodontal disease can spread bacteria to the liver, the kidneys, the heart, and even the nervous system. During the show, Dr. Carter describes a typical dental exam and the teeth cleaning process. She explains why a dental for our pets is done under general anesthesia and the many steps a veterinarian takes to make sure that process is as safe as possible for every pet. We also discuss preventative care for dental health and breeds that are more susceptible to periodontal disease. Learn how you can improve your pet’s life by taking care of their mouth! You can hear The Woof Meow Show on Z62 Retro Radio, AM620, and WKIT HD3 at 9 AM on Saturday. If you are not near a radio, listen on your computer at http://bit.ly/AM620-WZON or your smartphone or tablet with the free WZON 620 AM app. A podcast of the show is typically posted immediately after the show. You can download this show and others at http://woofmeowshow.libsyn.com/ at Don’s blog http://bit.ly/Words-Woofs-Meows and the Apple iTunes store. 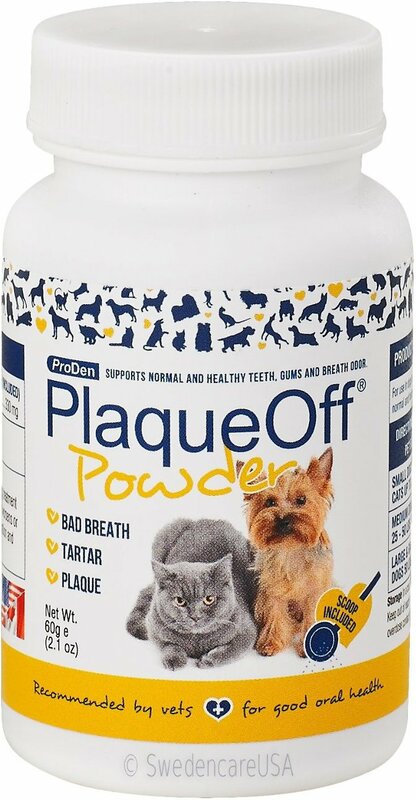 ProDen PlaqueOff® is an all-natural pet dental product that helps reduce tartar and makes your pet’s teeth whiter and cleaner; keeping your pets mouth and teeth healthy. It is effective against bad breath, plaque, and tartar. Unlike some dental products for pets, it is extremely easy to use; you simply sprinkle it on their food or give it to your pet as a treat. Your pet’s dental health is a very serious issue. According to the American Veterinary Medical Association (AVMA), periodontal disease is the most commonly diagnosed health concern in dogs and cats. Periodontal disease is a chronic infection, and it has been linked to; Diabetes, Heart attacks, Strokes, Kidney disease, Tooth loss, and other life-threatening disorders. The active ingredient in ProDen PlaqueOff® is a specially selected algae harvested in the North Atlantic, Norwegian Seaweed (D1070). ProDen PlaqueOff® Powder has been found to have specific beneficial effects for oral care, reducing bad breath by up to 63% after 12 weeks and reduces plaque by up to 35% after the first eight weeks. It may be used with both dogs and cats. 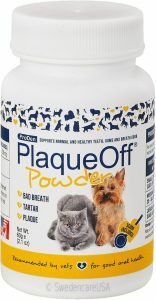 PlaqueOff® Powder comes in a granulated form which is easily added to your pet’s food every day. It is rich in natural iodine and contains important vitamins and minerals. 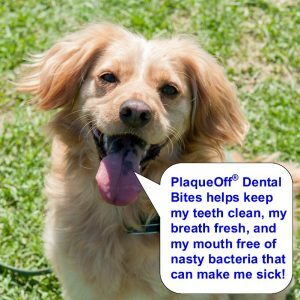 Unlike many other dental products for pets, PlaqueOff® is free from artificial colors, preservatives, gluten, and sugar. ProDen PlaqueOff® Powder Cat contains all the benefits of ProDen PlaqueOff® Powder, but with added brewer’s yeast. Don and Paula started using PlaqueOff® Powder with their cat Boomer in October of 2017. In three months they saw enough improvement with his teeth that they decided to add PlaqueOff to the products we sell at Green Acres. 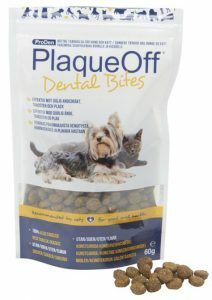 ProDen PlaqueOff® Dental Bites deliver all the benefits of PlaqueOff® Powder, inconvenient and tasty little bites your pets will love! Dental Bites are grain and gluten free as well as vegetarian! They are free from additives, sugar, and artificial preservatives. They prevent dental plaque from sticking to the teeth and soften already existing tartar deposits. Don and Paula’s dog Muppy gets two PlaqueOff® Dental Bites at bedtime every night to help her keep keep her beautiful smile. PlaqueOff® Dental Bites and PlaqueOff® Dental Powder have been accepted by the Veterinary Oral Health Council (VOHC). VOHC exists to recognize products that meet pre-set standards of plaque and calculus (tartar) retardation in dogs and cats. Products are awarded the VOHC Seal of Acceptance following review of data from trials conducted according to VOHC protocols. The VOHC does not test products itself. Regular use of products carrying the VOHC Seal will reduce the severity of periodontal disease in pets. both people and pets. Research indicates that phytocannabinoid nutraceuticals can be very useful in helping with allergies1, anxiety2,11, arthritis3,4,11, behavioral issues5,11, depression2, epilepsy and seizures5,6,11, inflammation7, joint health3,4, digestion, joint mobility11, nausea8,9, and pain relief and management10,11. Anecdotal evidence indicates cannabinoids may also be useful in increasing appetite, improving digestion, slowing tumor growth, and providing end of life comfort. A scientific report in the Spring 2016 issue of the Journal of the American Holistic Veterinary Medical Association (AHVMA) reviewed how 631 pet owners used cannabinoids with their pets12. Commonly reported benefits of cannabinoids were; provided pain relief, aided with sleep, helped relieve anxiety, offered nervous system support, reduced inflammation, reduced seizures or convulsions, reduced vomiting or nausea, helped suppress muscle spasms, aided digestion, helped with thunderstorm or fireworks phobia, inhibited cell growth in tumors and cancer cells, and helped with skin conditions. While hemp and marijuana are both plants in the Cannabis family, they are not the same. The appearance of these two plants are very different, as is how they are cultivated. Most importantly, the chemical makeup of marijuana and hemp is very different. Marijuana is probably best known for containing a cannabinoid called THC, the psychoactive ingredient in marijuana which can cause one to “get high.” Marijuana has a high THC content (5 to 35%) while the THC content of Hemp is less than 0.3%. THC content is critical as THC can be moderate to severely toxic to dogs13,14. Common signs of THC toxicity are: severe depression, walking drunk, lethargy, coma, low heart rate, low blood pressure, respiratory depression, dilated pupils, coma, hyperactivity, vocalization, and seizures. Cannabinoids are substances that occur naturally in both hemp and marijuana. There are 66 different types of cannabinoids. One is THC, the psychoactive component of marijuana. Cannabidiol (CBD), is the most abundant of the cannabinoids and can make up as much of 45% of the resin extracted from the cannabis plant. CBD is believed to have anti-anxiety effects and may counteract the psychoactive effects of THC. Since there is now a CBD based drug undergoing clinical trials, the term PRO (Phytocannabinoid Rich Oil) is being used for phytocannabinoid nutraceuticals instead of CBD. All animals have an endocannabinoid system that works with the bodies physiological, neurological, and immunological systems. Our bodies produce endocannabinoids which fit into specialized receptors throughout the body. In the dog, CB1 receptors are found in the brain, gastrointestinal tract, lungs, muscles, reproductive organs, and vascular system. CB1 and CB2 receptors are found in the bone marrow, brain stem, gall bladder, liver, and pancreas. CB2 receptors are found in parts of the brain, bones, skin and the spleen. Cannabinoid receptors in your dog’s brain play a role in the Cerebral Cortex (memory, thinking, awareness, and consciousness), the Hypothalamus (metabolic processes, appetite), the Amygdala (regulation of emotions), the Hippocampus (memory and recall), the Basal Ganglia (motor skills and learning), the Cerebellum (muscle control and coordination), and the Brain Stem (reflexes, heart rate, blood pressure, pain sensation and muscle tone). Producing adequate numbers of endocannabinoids is essential to good health. When the body does not produce enough endocannabinoids due to poor health, we can supplement them with phytocannabinoids derived from hemp. Are phytocannabinoids right for your pet? Whether or not phytocannabinoids are right for your pet is something that only you can decide, and I would suggest you do so only after discussing their use with your veterinarian. At the end of 2017, the World Health Organization issued a report15 indicating that CBD exhibits no effects indicative of any abuse or dependence potential, and in several clinical trials has been shown to effectively treat seizures. Research suggests that CBD/PRO nutraceuticals may be useful in treating a number of other medical conditions and have a good safety profile. The buzz over CBD/Pro products is enormous, so it is a “seller’s market.” Whenever that happens, it is not uncommon for some unreliable companies to get into the business. Before adding these products to our offerings at our store, we did a great deal of due diligence to select a company with a known track record and a commitment to quality and education. I would advise you to spend some time doing your own research before you buy a product or, talk to your veterinarian or a pet care professional you trust. Whatever you do, do NOT use marijuana you are growing yourself or that you buy from the couple down the road. You could kill your dog. 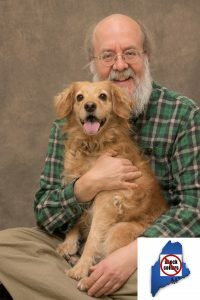 Don Hanson is the co-owner of the Green Acres Kennel Shop ( greenacreskennel.com ) in Bangor. 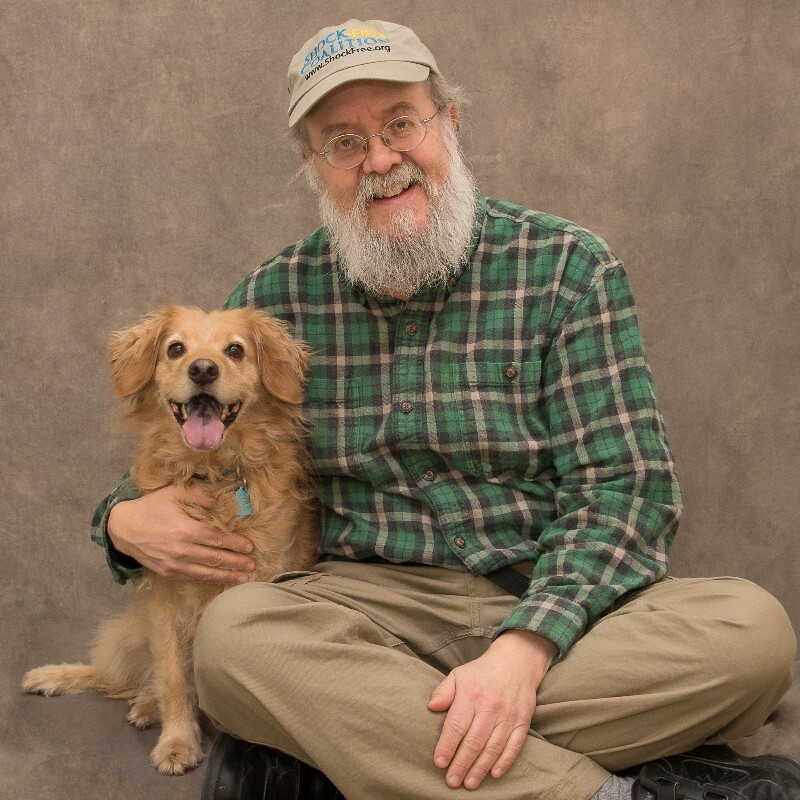 He is a Bach Foundation Registered Animal Practitioner (BFRAP), Certified Dog Behavior Consultant (CDBC), Associate Certified Cat Behavior Consultant (ACCBC) and a Certified Professional Dog Trainer (CPDT-KA). He produces and co- hosts a weekly radio show and podcast, The Woof Meow Show heard on The Pulse AM620 WZON and streamed at http://www.wzonradio.com/ every Saturday at 9 AM. A list of upcoming shows and podcasts of past shows can be found at www.woofmeowshow.com. Don also writes about pets at his blog: www.words-woofs-meows.com. He is committed to pet care and pet training that is free of pain, force, and fear. The opinions in this post are those of Don Hanson. In the past two months, I have been addressing Brambell’s Five Freedoms and how they provide a valuable reference point for assessing a dog’s quality of life. So far we have examined the first two of Brambell’s Five Freedoms; Freedom from Hunger and Thirst and Freedom from Discomfort. This month I will address Freedom from Pain, Injury or Disease. In many ways Freedom from Pain, Injury or Disease is directly related to last month’s topic Freedom from Discomfort as pain, injury and disease are often the cause of extreme discomfort. Ensure your pet is free from pain, injury, and disease. Regular and as-needed veterinary care goes a long way toward meeting this freedom, but breeding also plays a huge role, as well as how we respond when a dog is injured or ill. Mental disease needs to be considered along with the physical illness. Is your dog a working dog or do they compete in dog sports? Dogs that are more physically active have a higher probability of injury than the average pet. Appropriate physical training, just like that for an athlete may be beneficial. Also, if the dog is injured having adequate time off from work and sports to recover can be critical. Depending on the injury, retirement from the activity may be the best decision. Working and competing can negatively affect mental health just as much as it can cause physical problems. Are your dog’s pain and injury being adequately addressed? Sadly, I remember a time when dogs were not given pain medication because it was believed they did not need it. However, today we also need to ask ourselves are painkillers enough? Physical therapy, chiropractic adjustments, and acupuncture can be very helpful in alleviating pain in people as well as pets and should be considered. Does your dog see their veterinarian for regular wellness exams? – Dogs are subject to chronic diseases such as anxiety, arthritis, cognitive dysfunction, diabetes, kidney disease, obesity, periodontal disease and more. Early diagnosis and treatment of disease help prevent pain and discomfort. Every dog should see their veterinarian at least once a year for a wellness exam, and as they age this may need to be more frequent. Behavior and mental health should be discussed at every exam. Is your dog obese? Just as with humans, fifty percent or more of the dogs in the US are overweight. A dog that is obese is more subject to injury, pain, and disease. If your dog is a little chubby or profoundly corpulent, please see your veterinarian and learn how you can address this issue. Your dog will thank you. 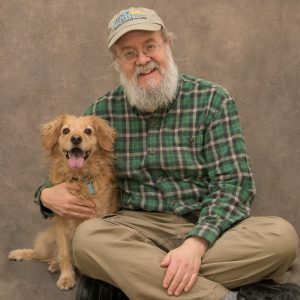 What is our responsibility when breeding pets? Some dogs, because of their breed standard, are intentionally bred for physical characteristics that often affect their ability to breathe, to move, and even to give birth naturally. How does this benefit the pet? Would it not be more appropriate to breed to eliminate these exaggerated physical deformities that affect soundness and health? Would it not better for dogs if people looking for a pet avoided these breeds? Are you doing all that you can to prevent and avoid genetic disorders? Most purebred dogs are susceptible to one or more genetic disorders. Are breeders doing everything that should be done to eliminate these diseases and create healthier pets? When a person is considering what breed to get, should they avoid breeds prone to genetic disorders? Are you as concerned about your dog’s mental and emotional health as you are about their physical health? Animals can experience mental disease and disorders (anxieties, phobias, dementia, ) just like humans. How do we reconcile that the treatments of behavioral issues are often not considered as necessary as physical disorders? Is it appropriate to breed a dog for behavioral traits that might be regarded as an asset for a dog who works or competes, but might negatively affect that dog’s ability to thrive as a companion dog? Next month we will examine the Freedom to Express Normal Behavior. Shared Blog Post – (Declawing Cats) Still Common in the US, yet Banned in Several Countries – Why Is This Happening? To read the entire post, just click on the link – http://healthypets.mercola.com/sites/healthypets/archive/2017/08/15/declawing-de-toeing-cats.aspx? 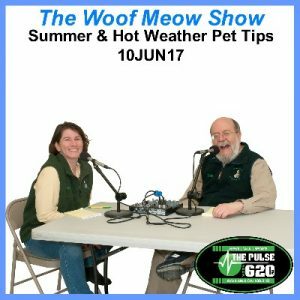 Kate and Don discuss a variety of pet tips directly related to summer and the increasing temperature. They start off the show discussing how the heat and the sun can adversely affect our pets and how to keep your pet cool. They discuss what to consider when leaving your dog in the car during the summer months and why shaving a dogs fur to keep them cool is usually a bad idea. Then they switch to water safety, followed by talking about how to deal with bug bites, stings, ticks, heartworm, fleas, and seasonal allergies like those caused by tree and grass pollens. Then they move to chemicals like lawn fertilizers, herbicides, pesticides, fungicides, insecticides, rodenticides and all sorts of other “…cides” that are routinely used in our environment to kill something we do not like. Natural products, like Cedarcide, a safe product for tick control are also discussed. Next, they discuss the gatherings of friends and family that occur in the summer and how that may negatively affect your pet. Lastly, they talk about the pros and cons of traveling and vacationing with pets including steps you can take to make the experience more fun than exasperating. You can hear The Woof Meow Show on The Pulse AM620, WZON, and WKIT HD3 at 9 AM on Saturday. If you are not near a radio, listen on your computer at http://www.wzonthepulse.com or your smartphone or tablet with the free WZON 620 AM app. A podcast of the show is typically posted immediately after the show and can be downloaded at www.woofmeowshow.com and the Apple iTunes store. 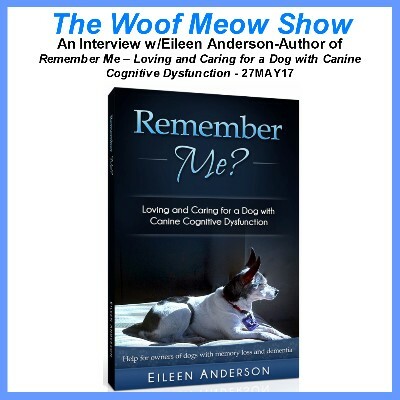 Kate and Don talk with author Eileen Anderson about her book Remember Me – Loving and Caring for a Dog with Canine Cognitive Dysfunction. 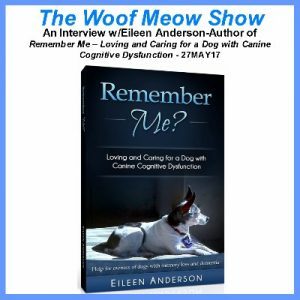 Like the author, Don and Kate have both lived with older dogs that developed cognitive dysfunction or what is often generically referred to as doggie dementia. No matter how old your dog is, we encourage you to tune into this show, so you are better prepared to recognize signs that your older dog needs some help. Kate, and Don interview Joyce Belcher, a Certified Herbalist specializing in work with animals. Joyce is also the owner of Herbs for Life, Inc., of York Maine, which is a small batch manufacturer of handcrafted Organic Pet Supplements for Horses, Dogs and Cats marketed as Pet Wellness Blends™ and Veterinary Botanicals™.